Ultrabook , MacBook Air and Chromebook laptops are valuable business tools and desirable for thieves. And some ultra-thin laptops lack a security slot making it impossible to attach a lock. 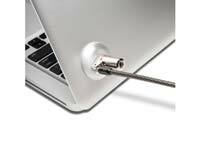 The Kensington Security Slot Adapter securely attaches to your Ultrabook and other peripheral devices that do not have a built-in security slot. Simply attach the adapter with the included ultra-strong, industrial-strength adhesive and you're ready to use a laptop lock to protect your investment. (Lock sold separately. ).